Why did you decide to study Accounting and Finance at UWE Bristol? I met some student ambassadors at a university fair in Birmingham. They gave me an impression of UWE as both a place of hard work and with ample opportunities to enhance my CV. When I attended an open day the lecturers I met were warm and easily approachable. 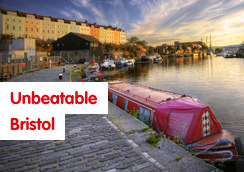 Then there’s also Bristol itself which is a friendly city and is pretty easy to get around. The course content is all highly relevant and provides a well-rounded education in accountancy. There's also the exemptions that we gain from our exams for our professional examinations which all helps. From time-to-time we have guest lecturers from the big accountancy firms like Grant Thornton who come in and take our lectures. I am taking the Audit and Corporate Governance module where we work closely on a simulation with Grant Thornton employees who are giving us an insight into their processes. The staff in the Department are all easily approachable and ensure we know how to get hold of them. They actively encourage us to ask them questions if we're not 100% sure about anything. My experience at UWE has been amazing. If I could do it all again I would! I found UWE to be such a friendly place that was really conducive to my studies and the extra-curricular activities. I’ve met so many new people, of which quite a few have turned into good avenues for networking for my future graduate job! I highly recommend UWE. What extra-curricular activities have you been involved in? I've been involved with the Hockey Club as both a player and an umpire which I've found to be great in terms of meeting new people and improving my communication and teamwork skills. I'm also a Student Ambassador where as a Team Leader I've had to manage other ambassadors according to the changing needs of the Events department. These activities have improved my communication, teamwork and leadership skills as well as my confidence. I've talked not just to a small number of people but to a full lecture theatre. These new skills will help when I apply for graduate jobs. Did you do a placement? If so, would you recommend it? I completed a placement at Oleo International, Coventry. My placement brought together all the theory that I'd learnt in the first two years and put it into practice. I have yet to come across a topic in my final year that I have not been able to relate to an experience on my placement. After graduation I hope to start a job in external audit as a trainee looking to qualify with ACA (ICAEW).